I remember when I first read the American Rose Magazine in 1985, long before the Santa Clarita Valley Rose Society was even a glint in the imagination of our eyes. I was fascinated with an article written by Howard Walters, "The Rambling Rosarian," where he extolled the virtues of "alfalfa tea." Howard said to buy a sack of alfalfa pellets and let a handful steep in a bucket of water for a couple of weeks. Then we were to splash some around all of our roses, and he said that it would work wonders. Hey, it sounded easy enough, so I tried it. Two weeks later, my cat Tigger was howling on the side of the house. I ran out to see if he had some animal cornered or something. I smelled a foul odor and figured the poor critter must be dead already. Or, was it a skunk? But, Tigger was only howling at the little bucket of alfalfa tea that I was brewing. Pweweeey! Boy, did that stuff stink to high heaven. Good grief, if this is how the stuff smelled, I wasn't so sure I should put it on my roses. I wondered how it would affect their fragrance. Well, I had to dump this nasty stuff somewhere, and it sure wasn't going down the gutter, because I was afraid of being arrested for dumping toxic wastes. So I applied about a cup to all of my roses (thankfully I didn't have very many roses at the time), and watered it in well. The next day, I couldn't smell a thing, because the alfalfa tea had been washed deep into the soil. My roses grew extremely well that year, and I have been using alfalfa ever since. I don't make alfalfa tea anymore. It makes my nose hairs stand on end. Instead, I just apply a handful of the pellets around each rosebush and water them in thoroughly. We do this two or three times a year. The alfalfa pellets are almost odorless. In just a few days the pellets dissolve and the earthworms come up from the depths of the earth to eat them, thereby tilling the soil. We buy a 50# sack of hay pellets from Fox Feed store in Canyon Country (Santa Clarita CA). It costs $13 (January 2018) for a large 50# bag without molasses. They also sell alfalfa containing molasses. We try to get the kind without molasses and grains, but that isn't always possible. One year I tried alfalfa meal, but I didn't like how the fine powder of the meal got up my nose and made me sneeze. I find the pellets are much easier to apply around the rose bushes without flying about in the air on a breezy day. Alfalfa is an important feed for horses, cows and other animals. Why is alfalfa good for roses? Because alfalfa (Medicago sativa, also known as lucerne) is rich in protein, vitamins, and minerals, and it has the ability to fix nitrogen, improve soil structure and tilth. Alfalfa contains triacontanol, which is a growth stimulant, and it is said to produce higher yields. Farmers grow alfalfa in their crop rotations and then plow it under to make the soil more fertile. If it's good enough for farmers to grow crops, it must be good for our roses. But, use it in moderation. Do not apply it as a heavy mulch on your roses. You only need to use a handful around each large rose bush (less for minis) three times a year. 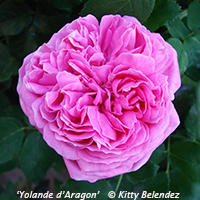 It wasn't long after I started using alfalfa that I heard about the benefits of using Epsom salts on the roses. Now, this sounded really silly, and I felt even sillier going to the drug store to buy several boxes of Epsom salts for my roses. Epsom salts is used not only for soaking the feet, but also medicinally as a purgative, or laxative. To save myself embarrassment, I told the clerk it was to soak my sore body after digging holes for all my new roses. Epsom salts was originally named for the mineral springs of Epsom, England, although now Epsom salts are commercially produced. Epsom salts is not a "salt," it is magnesium sulfate. There is a trace amount found in our local water supply, but because of our alkaline soil in Southern California, an extra dose of Epsom salts helps to neutralize it, which makes the roses grow more lush. I apply one tablespoon of Epsom Salts around each rose bush once a month. 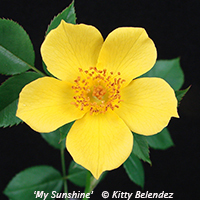 You can sprinkle it dry around each rose bush and then water it in, or you can mix it with other soluble fertilizers, dissolved in water, and feed it to your roses all at one time. I currently buy epsom salts from Crop Production Service in Oxnard for about $22, but they are only open on weekdays and they do not ship. I've seen Epsom salts on the Internet being sold for as much as $60 for 50 lbs., and at the drugstore it is priced at $3 for a four lb box. Seaweed (or kelp) is available in many forms. I buy a 50# bag from Fox Feed for about $29 (sometimes needs to be special ordered). 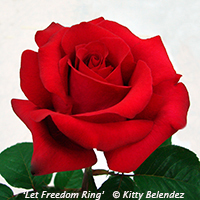 I apply about 1/4 cup of kelp meal around each large rose bush several times a year. I also use two forms of liquid kelp. One is a clarified version under the brand name of Response. This product can only be obtained via mail order, but as of 2011 it might not be available anymore. Response is added to my pesticide spray solution on a weekly basis. I use half as much as recommended as I feel that it has a tendency to make the foliage too large if using the higher dosage. It does make very lush, green foliage. I have never noticed any spray burn from using Response. The other liquid version of kelp I use is a seaweed extract made by Grow More, which I buy from local nurseries. A 1-quart bottle ranges about $18, and 1 gallon is $32. Because the Grow More product is brown and not clarified, you should apply it to the rose roots and not as a foliar feed, because it can discolor the blooms. If you've ever seen the label on this weird product, you'll think it was made by a witch doctor, or a medicine doctor during the wild west days. There are so many claims on the label that you can't even figure out what is in it. I've been using SuperThrive on my roses for about 15 years, and even though I can't tell you what's in it, I swear it makes my roses grow big and strong. Some say that the product may contain seaweed extract, vitamin B1, and other mysterious hormones. It's extremely expensive at $112 per gallon. (Amazon). Small 4 oz bottles sell for $11 at Lowe's. But a little goes a long, long way. 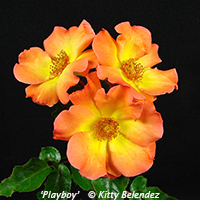 I only use about two tablespoons in a 50-gallon barrel of water (one drop per gallon), and I add it to the liquid fertilizer about twice a month when I feed my roses, so a one-gallon bottle lasts me several years. I'll finish this article by mentioning chelated iron. Roses need iron, and the chelated iron is best. Granular Ironite is not as good because it takes too long to release. Also, the granules of Ironite tend to get all over the cement and make stains. The chelated iron is powdered, which you mix in with the liquid fertilizers. It gets to the plants quickly and greens up the foliage in about a week. I use it once a month, especially during the peak rose growing seasons when we are giving the roses a lot of water, which leaches out the soil. I always make sure to apply the iron chelate about 2 weeks before a major rose show to ensure the greenest foliage. You can buy 5 lb bags of chelated iron at either Crop Production Service in Oxnard (Sprint 330 FE at $36), or at Orange County Farm Supply (Grow More brand). These elixirs must be used in combination with a regular balanced fertilizer schedule for best results. I do use all of the above products on a regular basis, and my roses are big, strong, lush and full of beautiful blooms.